Today’s post is based on the 107th chapter of the Book of Psalms. This is the fourteenth psalm of praise and it tells us why a specific set of people should praise the Lord. Of course these groups are only used as examples because every living creature is supposed to praise the Lord. Let every thing that hath breath praise the Lord. Praise ye the Lord. The six groups of people that Psalms 7 presents are: the redeemed or Israel; the rebels; fools who go against God’s word; sailors with bad experiences at sea; and both the rich and the poor people. This post will focus on that 4th group of people, the sailors. My own history is that I am from the island city of Galveston, TX, so I have a great appreciation for those whose lives revolve around the sea. The sailors’ story is told in Psalm 107:23-30. If there is any group of people who should be able to appreciate God for His deliverance from an angry sea, it should be this group of people because the sea is where their business is conducted. These are the people who can see just how beautiful the sea is when the weather is good. Its quiet and majestic beauty is breathtaking. On the other hand, they also know that the sea can be horrible when the weather is bad. I lived through a terrible hurricane named Carla when I was 16 years old and I saw her firsthand effects on the Galveston Island. I know that the tempestuous sea can be awful! A ship in the middle of that kind of storm must have been a frightening place for the sailors to be. The “he” in this verse refers to God Himself. Only God has the power to raise this kind of storm and lift the waves in this manner. As a little girl, I remember that my Grandmother would make us sit and be still in a storm because God was doing His work. If men were wise today they would hold a better appreciation of God and His awesome power. I’m not saying that every storm is an an act of God’s anger, but it would be wise for men to recognize that He has the power to stir up a storm. And yes, negative circumstances could very well be the result of God’s anger at our bad behavior. Try to imagine with me how it might have been for the sailors on this ship. At first, the waves appear to take the ship as high up as a mountain. Then, it pauses at this height for a moment. Inhabitants of the ship see the valley of the wave on both sides. In the distance they see the mountains of other waves. The sound of the powerful wind is so loud that it threatens to shatter their eardrums. Then suddenly, the wave runs from beneath them and the ship takes a deep plunge into the watery valley of death below. 27 They reel to and fro, and stagger like a drunken man, and are at their wits’ end. The battering of the winds, the waves and the fright would cause some men to absolutely lose their minds. For some, all hope is gone. 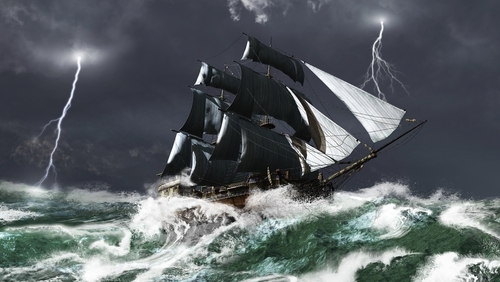 The physical abuse of the winds on the ship makes it feel as though the ship will either be crushed or torn apart. The men wait, some of them expecting to be absolutely destroyed. They reel and rock with the movement of the sea; it is difficult to keep their balance. Can you imagine how it would feel to have your very foundation shifting like that? We depend on the place that we stand on to be sturdy, still and safe. It must be overwhelming to have your very foundation shifting. For these men, the years of experience of the crew did not matter. These men needed God’s help in the worst way. The men humbled themselves and made a wise decision. They cried out to God who was the only one who could deliver them. They cried, “Oh God, save us!” Buddha couldn’t do it. Mohammed couldn’t do it. This storm required a living God of Power and they had sense enough to know it. And what did He do when they cried out? The 29th verse tells us. I don’t believe God had to yell at the storm. He didn’t have to say, “Hey! Waves, stop that”. He didn’t have to grab the whirlwind and shake it to make it stop. Remember how our Moms would give us “the look” in the grocery store when we were acting up? We knew that look meant that we needed to stop it! immediately? I believe God just gave the storm the “look” and all was well. That’s our God of power. That’s our God of might. And what happened after the storm ended? When God quieted the sea, the sailors immediately saw good weather. The dolphins were jumping again and the sun was shining. The waves were gentle, and a cool breeze was blowing. The sea appeared as though nothing had ever happened to it. These were some happy men. With their newfound peace, God quickly took them to where they were trying to go. Don’t you imagine they had a beautiful story to tell their families, friends and neighbors about the goodness of God? I’m reminded of another situation in the New Testament when Jesus’s disciples had a similar experience. It is found in Mark 4:35-41. This situation was the same as that of the sailors in Psalms 107. The difference is that in the book of Mark, the men had Jesus on board. Jesus was quietly asleep on a pillow in the lower part of the ship. He was not worried about the little storm that blew up because He knew that He had the power to still it. He simply rebuked the wind. He might have said, “Oh shut up!” and the wind quieted. He said, “Peace, be still!” And everything negative turned positive. The Apostle Paul, in Acts 27 and 28, was involved in a great storm in which the ship was destroyed, but God did not allow one soul to be lost. Paul extolled God’s goodness for his deliverance. We should do likewise when we are delivered from a great storm. We will all experience storms in our lives. Every storm that arises is not the kind that occurs in the sea. Some are storms of sickness. Sometimes a storm is related to misbehaving children. At other times the storm may be related to our finances. These kinds of storm are just as real as those faced by the mariners in Psalms 107 and those faced by the disciples in the 4th chapter of Mark. But the solution that quieted the storm then is the same solution for today. Call on the name of the Lord and He will answer prayer. Rare is the person who is able to say, “I haven’t had any storms in my life”. To them I say in the words of my late Grandmother Ada, “Baby, just keepa living. The storms will be there.” Storms are meant to drive us to God, so when they happen, just cry out to Him. You need to repent first, so that you can be right with Him. If you are not saved and you try to cry out to Him with anything other than repentance, He might not answer. But if you repent of your sins, you will have a right to call upon the name of the Lord and He will answer. Has anyone noticed that whenever America gets into trouble we (they) don’t mind calling on God? That’s a very good thing to do. Unfortunately, though, as soon as the storm is quieted, America goes back to our (their) sinful ways. We (They) act almost embarrassed that we (they) had to call on God for help. That foolishness needs to stop though, because if we (they) don’t break this cycle, one day we (they) are going to call on the name of the Lord and He is not going to answer. In Proverbs 1:22-33 He said that He would mock them when their calamity comes. There’s a storm coming and we need to be ready for it. We should be in a position so that we will be able to call upon the Lord and have Him deliver us out of all of our fears. Let us pray for our Country. As a matter of fact, let’s you and I pray now before the storm comes. May God bless you. Previous Do You Now Believe? This ost was written a year ago. Get ready for the coming storm. Happy Resurrection Sunday, 2019. Jesus Lives! Jesus is Coming Back Again.